» How Many Cards Should You Sign-Up For? The promise of massive point balances, luxurious upgrades, and free travel is an easy trap to get you to press “Apply” a few too many times, even when you can’t hit the minimum spending requirement or the card isn’t that great. Trust me, I know. When I first stumbled into the world of credit cards, I fell for the $100 bonus here, $75 gift card here nonsense, but since then I’ve realized that there are much better cards out there and I can get multiple at a time. 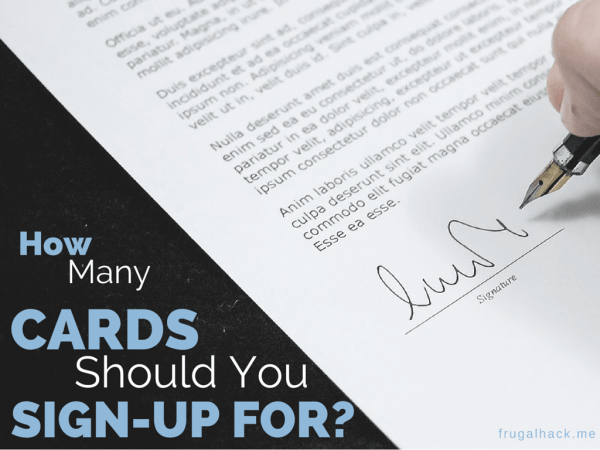 So, how many cards should you sign-up for and what makes a card worth signing up for? That’s completely up to you, your comfort zone, and your preferences, however, in this post we’ll look at a few different strategies to determine what works best in your scenario. There are two main strategies used to determine the amount of cards you should sign-up for at one time. The first one is the “As You Go” strategy, which works just like it sounds. The second is the “Churn” strategy, which is similar to an all you can eat buffet, but for credit cards. Related: Should You Manufacture Spend? With this strategy, you apply for cards when their sign-up bonuses are at their peak. That way, you only apply for one or two cards at a time and spread out the applications throughout the year. Not only does that help you limit the amount of inquiries on your account at one time, but it also helps to maximize the amount of points, cash back, and/or miles earned from each application. Personally, this has become my favorite method as of late. I love the idea of the Churn strategy, but with this method, I feel like I’m getting the most out of my inquiries. And if new credit cards hit the market, I can apply for them immediately, without waiting 3 months between churns. The Churn strategy gives you the ability to earn a large amount of points, miles, or cash back all at once. That’s because with this strategy, you sign-up for the maximum amount of cards you think you can handle (or the banks will approve), which could be 3, 6, 9, or 12+ cards. Assuming each card’s bonus equates to two domestic economy seats, that’s 6, 12, 18, or 24+ flights earned at one time. Not too shabby eh? There’s no doubt that this is the best way to maximize your points earned at one time, but it also comes with risks. Those risks are that the bank(s) will deny you due to the amount of hard inquiries you are receiving all at once. That’s because, to the bank(s), you look like you’re grasping for credit which makes you a risky person to lend too. In the past, I have used this strategy to apply for cards, but every single time its lead to at least one denial. Which Strategy Is for You? Before you decide on either strategy (and don’t worry you can switch between them at any time), make sure you can hit the sign-up bonuses. If you can’t hit the bonuses, even if you miss out on a single one, it’s a waste of a hard inquiry. Seriously, don’t do it. What Makes a Card Worth Signing-Up For? How much are you will to sell your hard inquiries for? Every card you apply for will cost you one inquiry with the exception of Capital One (they charge three), so you need to determine what you’re willing to sell them for. After all, you only get a certain amount of them before all of your applications become denials. Are you willing to sell them for a steady monthly income or do you want one lump sum? By this I mean, do you want to get a card to manufacture spend over a time period or do you want a card to churn and burn (ie. get the bonus and sock-drawer it). My own rule is that I have no problem with either method as long as I receive $400+ worth of value over time from the deal. That may sound like a high requirement, but thanks to the generous bonuses the banks offer, it’s not a challenge at all. Deciding on which card(s) to get is totally up to you (see a trend here?). The best thing you can do is to get a goal in mind and apply for cards that work towards that goal. For example, if you wanted to fly to Hawaii, Avios would be the way to go (at least from the West Coast), so you’d want a card that earns or transfers to Avios. If, instead, you wanted to fly to South America, you’d want to get LAN miles or points that transfer to LAN. Of course, if you’re new to the world of points and miles, you likely don’t know which cards earn what, which points transfer to what companies, and/or what programs would be best for each location. However, don’t worry, you can find that information on Flyertalk, Reddit, or you can just contact me and I can help you out. To get back to the original question, how many cards should you sign-up for at one time? That’s totally up to you, but hopefully this post will help point you in the right direction.